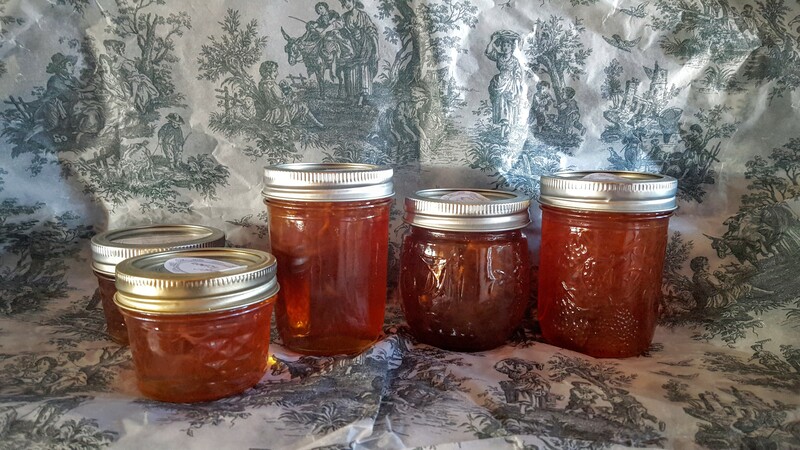 I found two great marmalade recipes, one very simple one and one more traditional. Rinse the lemons and pat dry. Zest the lemons using a large peeler/zester. You want pretty thick strips of the zest, about 1/8 inch thick. 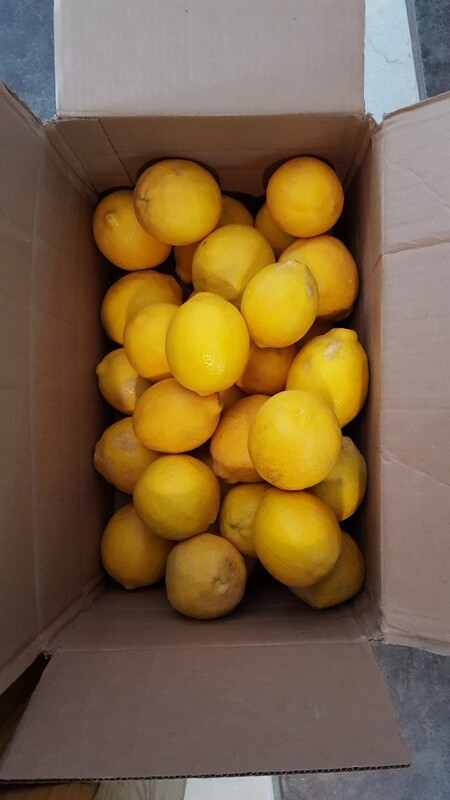 Then, cut lemons in half and juice, reserving the juice (about 4 cups). In a large, heavy saucepan, cover the strips with 8 cups of cold water and bring to a boil; boil for 1 minute. Drain the strips and rinse under cold running water. Blanch two more times; the final time, drain the strips but do not rinse them. 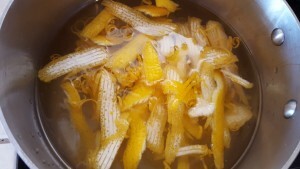 The strips will break apart during the blanching process. Return the strips to the saucepan. Add the reserved juice and the sugar. Simmer over moderate heat, stirring to dissolve the sugar, then skimming any foam, until the marmalade sets, about 30-40 minutes. Ladle the marmalade into 5-6 hot 1/2-pint canning jars, leaving 1/4 inch of space at the top. Add lids and screw on rings. Process in water bath for 15 minutes. Remove and let stand at room temperature for 2 days before serving. For some reason, this “faux” marm turned dark and almost honey looking. 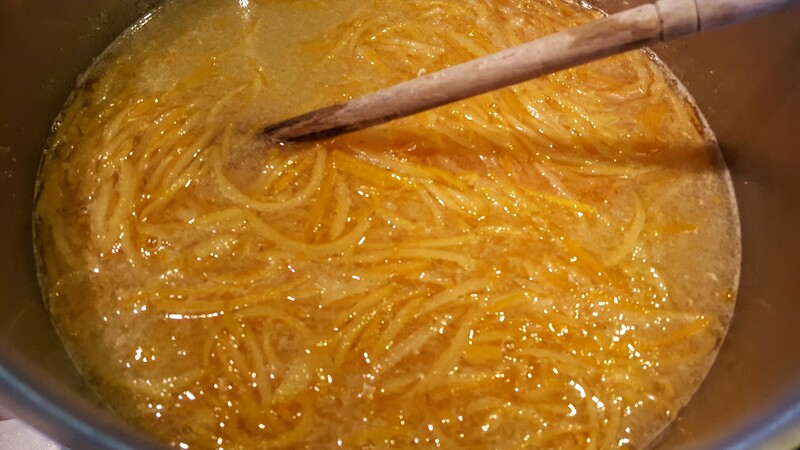 My more traditional marmalade (made from this recipe), was bright and sunshiny. We did taste tests and sent a couple of samples to the in-laws in Houston (from whence all the lemons came). So far, none of us can decide which is our favorite, the faux or the traditional. Meyer lemons are in season this month so seek out some and make some marm! I’d eat either of these, but I’m curious about the ‘faux’ moniker. Maybe I’m just not a marmalade expert, but it seems real enough to me. Oh Debra, you lucky girl! I just visited your other post too. That Lemony Brown Sugar Syrup sounds awesome! My oh my, your house must have smelled like lemon heaven while you were making all those goodies. 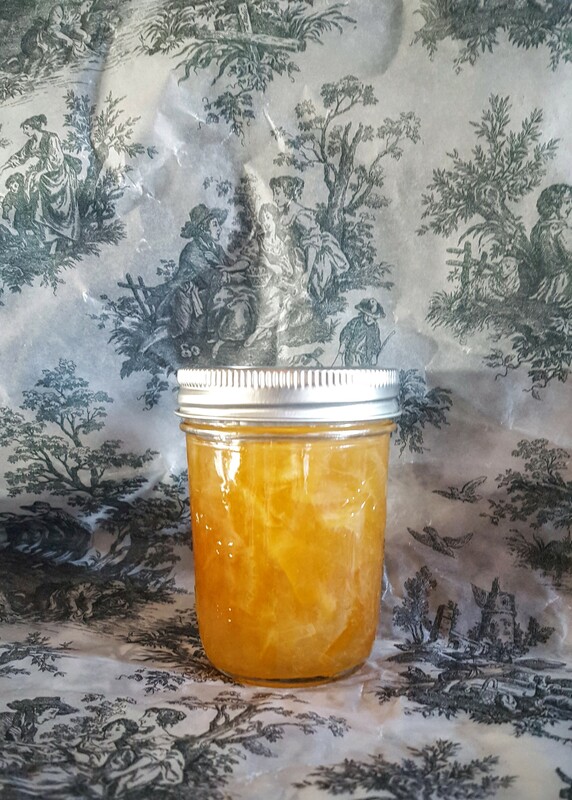 I’ve never had the desire to make any kind of marmalade but you make it sound fairly easy. I would love to preserve the goodness of Meyers some how. I’ve thought of making Lemon Pickle but just haven’t been able to bring myself to doing it. Perhaps one day, I’ll try my hand at marmalade! Thanks so much for sharing, Debra…I have a feeling you’ll be sharing lots of yummy Meyer recipes!!! Lemon pickles? You have me intrigued, Louise. I would have loved to preserve some of these but they were too big to fit in pint jars. I don’t know. I don’t think I cooked it too long. I did two batches of this and they both turned honey-hued. Lemon may even edge out chocolate as a favorite flavor for me. I know, I know……chocolate usually rules but wow, I’m a lemon lover. Homemade marmalade sounds like heaven. Why can’t I live next door to you?! I crave lemon. I eat very little jam, but make an exception with marmalade. Together??? Oh my! Oh my! Ice cream topping. On pork chops. Chicken. Filling for sweet rolls. We haven’t even come to toast, biscuits and muffins. I love the tartness of this. I can attest that it is marvelous on toast! I’m not sure why you call it faux – any gelled substance made with citrus is marmalade – right? Maybe it is non-traditional like mine…………both of them sure look delicious! That recipe sounds fantastic. If only you could share all those Meyer Lemons with the rest of us, we would probably make some too. But they are kind of scarce & expensive if you don’t have a tree of your own! Yep, I am pretty lucky in getting the spoils from the in-laws tree. You lucky girl!!! Need to find me some Meyer Lemons! This looks great!